< Competition Time & Celebrations!! 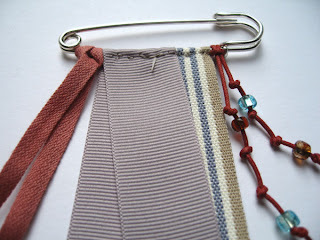 I was trying to think of a new tutorial to share with you all and suddenly I thought of making a kilt pin brooch! We have sold these in the past, now we only make them for fairs or commissions and they were always very popular, I have had my own one permanently pinned to my jacket for years. 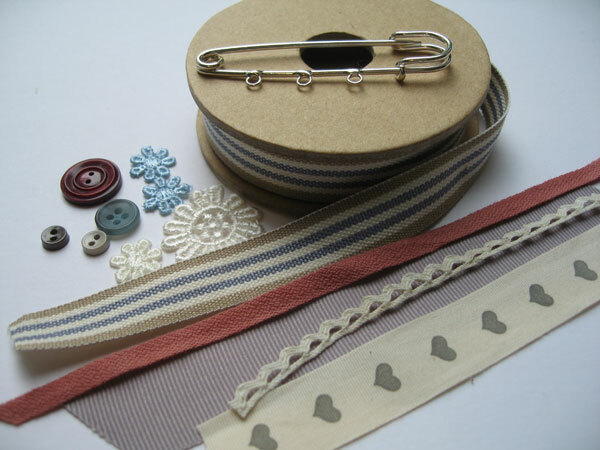 Make a rosette from tape or ribbon. First cut a piece of ribbon about 12 cms long and fold in half wrong side out. Sew the two ends together and then sew a running stitch all along one edge. 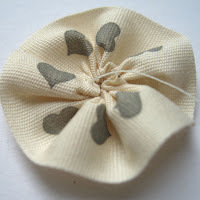 Pull the cotton tight to make a rosette. Narrow tape or ribbon can be attached by folding in half and then putting the two loose ends through the loop and pulling tightly. 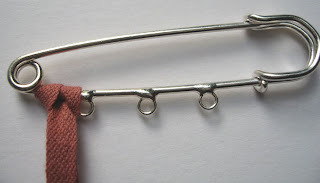 Attach some thicker ribbon by folding over the pin and sew with a running stitch. It looks good if some of the ribbons overlap.We have also added waxed cord here, pushing a bead on and knotting underneath looks great and adds a bit of sparkle! 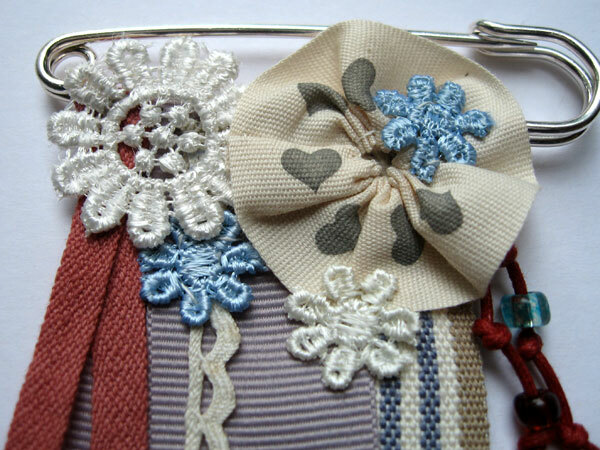 Next we sewed lace flowers and the ribbon rosette we made earlier in place. Finally attach some buttons by sewing through all the layers to keep everything firmly in place. 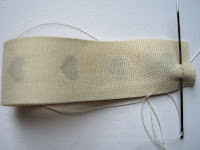 Trim the ribbons, cord and lace to make a good shape. Then stand back and admire your work! 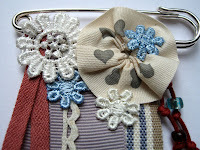 This entry was posted in Tutorials and tagged brooch, kilt pin, lace, ribbon, sewing, tutorial. Bookmark the permalink. This is fantastic – thanks for sharing! You have such a fun blog! 🙂 I'm now following you from Welcome Wednesday and would love to have you follow back at http://www.dandygiveaway.com! 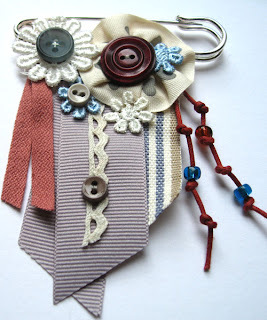 that is so cute.. i will have to make one soon. Following form Wednesday blog hop. A friend of ours wears a kilt sometimes. He happens to teach Gr. 5 at one of the local schools. I'm sure his students would be totally impressed if he showed up with a pin like the one above! Hi! I'm following from WW blog hop. I'm looking forward to seeing your other creative goodies! Tina "The Book Lady"
Following through WW! Would love to have you follow back.